Of all the places you can explore by 4X4 (barring remote trackless desert country), Arnhem Land is without doubt the most mysterious. For the vast majority of us, it is a place shrouded in mystery. There were occasional magazine articles about Cobourg Peninsular, but they were rather short on who, what, how and where. Online searching didn’t help much either, with more negatives than positives being found. The negatives were portrayed in the form of the language surrounding the permission required to access the area. You need a permit to go across Cahill’s Crossing into Arnhem Land (and if you don’t have your permit, you could lose your 4X4). Cobourg Peninsular is at the end of that unknown road. You need another permit to get in there. Stories of restricted numbers and the need to book months in advance abound – and what is actually there, after all? Is there fuel or isn’t there? Are there supplies or aren’t there? What is the camping like, if there is any? Talk about a mystery bag! No wonder it receives just a trickle of visitors each winter. Well, let me throw some light on this magical place. If you go into the tourist information centre in Kakadu and ask about going into Arnhem Land, they will direct you to a short visit to Gunbalanya (we knew it as Oenpelli) and then advise you to visit the Northern Land Council office in Jabiru to collect your permit to access the town. But a two-hour visit to Arnhem Land isn’t quite what I call an Arnhem Land trip. Your Gunbalanya permit strictly advises that it only entitles you to visit the artwork building in town, and nowhere else. I have even been told that your permit doesn’t allow you to stop on the road leading between Cahill’s Crossing and Gunbalanya, which is a shame as it passes very close to the best rock escarpment and lily- and waterfowl-filled lagoons that you will see anywhere in Arnhem Land. So what permits do you need to get up to Cobourg? Well, you need a transit permit and a camping permit; but it is made easy for you. Apply for your permit online with the Northern Territory Parks and Wildlife Service. It initially seems expensive at $232 per vehicle – but this covers your transit permit through Arnhem Land from Cahill’s Crossing to the boundary of the Garig Gunak Barlu National Park (try saying that quickly ten times) and includes camping in the National Park at Smiths Point campground for up to seven days for the whole family. You do have to nominate your dates of travel, as these are noted on your permit; and numbers are restricted. There are two large camping areas known as Site One and Site Two, and camping elsewhere in the National Park is not permitted; but the camping areas are large and well spaced out and I have never seen them full. So I reckon you would be very unlucky not to get the dates you were after. That’s it as far as the permits go. If you aren’t fussed about seeing the artworks in Gunbalanya (which whilst very good, can be very expensive), then just get your permit to go to Cobourg. Next myth: Cahill’s Crossing. This is a concrete causeway across the East Alligator River. It is affected by tides, so if you get there on a dead low tide there will be a trickle of water running across the concrete; if you get there on high tide, the water will be up to (or over) a metre deep running across the causeway (either coming in or going out), and definitely impassable. Yes, there are big crocodiles at Cahill’s Crossing too! So don’t walk it, and don’t drive it if there is any risk at all of being washed off the causeway. Just wait until the tide drops, watch the locals and the service vehicles crossing the causeway (they even provide a viewing deck for you to do this) and go when it’s safe. As a broad assessment, some say you can cross any time as long as it’s not within two hours of actual high tide. Finding when high tide is at Cahill’s Crossing is the trick – try the Willy Weather website where there is a link in the Breakout Box to Cahill’s Crossing tide times. To make it easier for you, it is generally safe once the water level is below your sidesteps. Once safely across Cahill’s Crossing you have just under 300 kilometres of what I describe as reasonable unsealed road driving ahead of you. This 300 kilometres, with a group, usually takes me between five to six hours of driving with breaks for morning tea and lunch along the way. Like any unsealed road it needs to be driven with a keen eye for washouts, ruts and some sandy sections. Just don’t rush it. Speeds will vary from as high as 80kph on some of the better stretches to down around 40kph – especially once you enter Garig Gunak Barlu National Park where the road narrows and becomes far more winding. The first 50 kays from the crossing are partly sealed but mainly severely corrugated; keeping your speed at the point where you can skip over the corrugations is the key to this type of road surface (along with dropping your tyre pressures down so they are no more than 32psi when hot). Make a left turn towards the National Park (straight ahead leads to Maningrida and Nhulunbuy, and even more permits that are difficult to obtain). The next 110 kilometres takes you on unsealed road through typical Arnhem Land scrub, low dry grass amongst slender and not-all-that-high eucalyptus trees. In the dry season (the recommended time to travel) there are frequent slow burns creeping across the whole of the Top End, and you will regularly encounter these. They don’t present any great problem; just watch for a sudden flare-up of thick grass as it can generate a lot of heat. The other major issue with the slow burns is fallen trees across the road – these can be quite numerous. You will cross a few open creeks too… the water is quite low and a couple have nice clearings beside them to stop for a cuppa. The water crossing just before Murgenella can be rough. Be warned, this waterway has crocodile access – but from experience, some nice Barra too! There are a few more intersections along the way. Just keep following the signposts to the National Park. Take the turn-off to the Ranger headquarters and you will get a good glimpse of the pristine waters of Port Essington. On arrival at the Ranger headquarters you will meet Alan, the head Ranger.If you’re lucky you might also meet his wife Emma, who has a little shop that sells some great handmade jewellery. Note which camp you will be staying in, and follow the track down to your campsite. Both large camping areas are found up beyond the airstrip. They are both well back from the water’s edge – in fact, you can’t look out over the water from your camp as it is at least a 300-metre walk away. Each camping area is serviced by a flushing toilet and a hot shower. Inland from the camping area is a scrubby billabong, which unfortunately is home to lots of mosquitoes and as well as the resident crocodiles… so this is not a place to go wandering around at night. I have to say that as a tour operator, I do get the privilege of a separate campsite which overlooks Port Essington. We can sit and watch the sunset over the water from our camp. It is one of the best camping areas that I know of, but we do pay for the privilege of using this exclusive area. On the plus side for individual travellers, you can be assured you won’t have Vic and another eight vehicles crowding you in at your own camping area. What is there to do now that you’ve made it all the way? Fishing off the beach, crabbing around the rock ledges at low tide, beach walks; and there are lots of great Top End birds to be seen. You could join Venture North on a guided tour to Victoria Settlement, or even a fishing charter off the coast… highly recommended! There is a great coastal drive, too. For this you should allow at least half a day to explore the various bays, black sand beaches, red sand beaches and crocodile-sunning beaches. The track is not difficult, but it is narrow in parts. I recommend at least four days in Cobourg. Add a day to get up and a day to get back and you have one of the best week-long trips (out of Jabiru or Darwin) that you can do anywhere. Like me, I’m sure you will acknowledge that this is indeed one of the last frontiers for 4X4 touring anywhere in the country. Arnhem Land is found in the Top End of the Northern Territory. Jabiru in Kakadu National Park. There is no accommodation once you enter Arnhem Land from Cahill’s Crossing (but plenty in Jabiru and surrounding areas). Camping is only permitted at Smiths Point in Garig Gunak Barlu National Park – there are two campgrounds, each served by a single flush toilet and hot shower. Garig Gunak Barlu National Park is only open from May until October, and even then it is weather-dependent. If there has been a late wet season, expect access to be denied. My recommendation is June to late August. 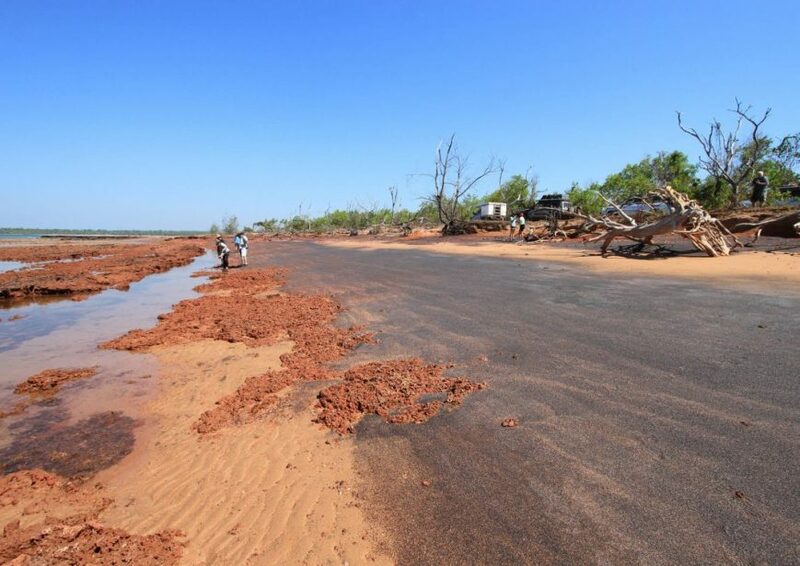 There are no shops or fuel stops after you leave Jabiru, so take all the food and water you will need for at least seven days; and carry enough fuel for 800 kilometres. Alcohol may be carried but not consumed whilst in Arnhem Land – but you can have a quiet drink in the National Park. Okay for true off-road trailers. Motorcycles and quad bikes are not permitted. For fishing charters and to visit Victoria Settlement, contact Venture North. The tour is superb and the fishing is awesome!